Performers include: Christina Ricci, Mike Vogel, Michael Mosley, Kelli Garner, Margot Robbie, and Karine Vanasse. This dramatic TV series takes place in 1963. It’s a time when only a lucky few could afford to take flight, experience a global adventure, or gain a front-row seat to history. The lucky few that could afford it flew on Pan Am, the largest, most prestigious airline in the world. Pan Am’s Clipper Majestic plane is about to embark on its inaugural flight with Captain Dean Lowrey (Mike Vogel) at the helm. Dean, recently been made captain and wouldn’t trade this moment for anything in the world. His First Officer and Co-Pilot is Ted Vanderway (Michael Mosley), a former Navy test pilot. He finds the commercial skies every bit as turbulent as he struggles to overcome past mistakes and prove his worth as an aviator. The Clipper Majestic’s Purser is Maggie Ryan (Christina Ricci). She’s climbed her way up to a better life and is at last riding high; determined not to fall. Kate Cameron (Kelli Garner) left her sheltered life in East Granby, Connecticut to brave the intrigue of a wide new world. Now, she must brave even more intrigue as an international agent for the CIA. Kate’s sister, Laura Cameron (Margot Robbie), left her past and future by running off on her wedding day. She’s following her older sibling to the skies of Pan Am. It’s a bold move and one with serious personal consequences. Colette Valois (Karine Vanasse) was born and raised in France and has an innate understanding of international affairs. In affairs of the heart however, she’s still struggling to find her way. The crew of the Clipper Majestic travel to intoxicating cities such as Paris, Berlin, Monte Carlo, and Rome. Along the way, they also happen to bump into history. Ted becomes increasingly nervous as wedding plans race forward; Kate wrestles with suspicions about those around her; Laura receives a startling offer from Amanda; Maggie is placed is a perilous position. The crew is flying back to New York, but this time the plane’s a little light. Prince Omar and his staff are the only passengers, and in fact the Prince is serving Colette as another of his charming ways of wooing her. Their romance is going so well, in fact, that he asks for her permission to formally court her. She would come live in her own wing of his family’s palace with her own staff and an unlimited clothing allowance—NICE!—while she meets his family and his parent’s staff investigates her background. Oh, and she’d have to take a six-month leave of absence from . Colette decides to take a few days to think it over. Dean doesn’t need quite that long to realize he doesn’t like it at all. He’s still very much in love with Colette, but thanks to his last night of passion with Bridget, he’s lost her for what now seems like forever. To add to the captain’s woes, he’s just been grounded pending a hearing on his actions when he was forced to land in Haiti. It looks like the rich, jerk passenger from that flight is suing , and one of the stipulations for settling the suit is that they have to fire Dean. The hearing’s not going well, until Captain George Broyles shows up to testify on Dean’s behalf and deliver a letter from Juan Trippe, the founder and owner of , stating that Captain Lowrey gets to keep his wings. Instead, he gets a six-month suspension. Too bad he can’t spend that in a palace like Colette. So why did Captain Broyles save the job of a guy who socked him in the jaw a few months before? That’s because Maggie Ryan came to the rescue! It turns out she decided to go into business with Broyles after all, and the two have opened up a nice little smuggling operation over the past couple of months. Most recently, she smuggled in some antique jewelry for some new buyers. She insists on going with Broyles for the exchange, and that’s when her new, genuine knowledge of Portuguese saves them from getting robbed by some gangsters. She comes back herself later, and negotiates the deal herself. Broyles is impressed, and the two of them celebrate by fooling around on a bed covered in cash. Ted is still faced with a dilemma. Amanda loves him and is a great match for him and their families are an even better one, but he doesn’t love her. He loves Laura, and he finally tells her so. The two of them finally kiss, and Ted calls off the wedding. But it turns out not to be so easy when Amanda meets Ted to tell him that she just found out that she’s pregnant. It looks like the marriage is going to be back on. Prince Omar continues wooing Colette as the background check commences. She tells some investigators about her childhood in an orphanage in France, and they uncover a shocking truth about her and her family. Her real name isn’t Valois—the nuns in the orphanage changed it to hide the fact that Colette is Jewish—and her parents weren’t members of the French resistance. They were killed in a concentration camp. On top of all of this, she finds out that, somewhere out there, she has a younger brother who probably survived and was adopted by another family not long after they were taken to the orphanage. Due to these revelations, the official courtship ends, but Colette is excited at the opportunity to find her lost brother, and Dean insists on helping to lead the search. After all, he’s got six months off of work. Kate opens her front door one evening to find Richard there, bleeding from a gunshot wound. He has a microfilm that the Russians are after and a double agent sold him out. He sends her off to the CIA to deliver the microfilm, and tells her that no one knows he’s missing, so if anyone asks about him, they’re the double agent. Not far from her front door, Anderson, her contact at MI-6 stops her and tells her Richard is missing and believed to be a double agent himself. Kate’s not quite sure who to trust when she rushes home and finds the microfilm canister empty and Richard gone. But he turns up again a few minutes later with the microfilm, now knowing he can trust her and that Anderson is the double agent. Later, Kate meets Anderson at the train station and tells him she has the microfilm. He insists she hand it over, but when she suggests that they take it to the CIA together, he pulls a gun on her. But where he’s got one gun, Kate’s got several as it turns out everyone in the train station is a spy and the whole meet was a sting. As everyone gathers at Ted’s apartment on New Year’s Eve to watch the ball drop, we’re left wondering what 1964 will bring for the crew of the Clipper Majestic. What will happen when Ted has a chance to tell Laura that Amanda is pregnant? Will Maggie get caught at her new smuggling operation? Can Kate continue to survive in the spy game? And will Dean and Colette find their way back to each other while they try to find her long, lost brother? As always in the Jet Age, the future is full of possibilities. Courtesy ABC. First aired: February 19, 2012. Oh I loved watching this show and always made sure to DVR it so I could watch it again later. One if the best things I enjoyed about it was how they stewardess carried themselves. Why do they want to cancel such a great show!?? 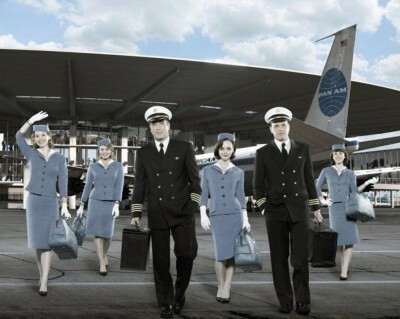 pan am needs to return. joe and laura belong together. this is one of my favorite abc shows. i have watched it, since the first day it was on the air…. I really really enjoyed this show. In fact, it was one of the few that I watched regulary and looked foward to. Bummer they canceled it. Loved the show. Sorry that the selected Nielsen 18-25?/35? year-olds’ bracket weren’t there watching last year. The audience are too fractured for good period television. Great show. I hate that the network cancelled it. I loved that show and logged on to see when to set my DVR! I’m super duper bummed that it has been cxl’d. I too hate reality tv and love a show like this one that actually required acting! BRING IT BACK!!!!! Bummed! I was just wondering when PanAm was coming back! My husband and I loved the show! I can’t believe it was cancelled and we have all these dumb shows that are making it. The adults of this country want real television, not some aweful reality tv…that most of the time is not even true reality! PLEASE BRING BACK PAM AM… IT WAS A WONDERFUL SHOW AND I TOO HATE REALITY TV.